I would love to see a kitchen garden behind every house, community, and schoolyard in the U.S. I think growing your own food promotes healthier lifestyles, both through improved diet and the physical work of planting and harvesting. Kitchen gardens teach kids about working with nature and gets them excited about eating fresh foods that they have grown themselves. Kitchen gardens also help to bring nutritious foods to communities that may have limited access to fresh fruits and vegetables or other food insecurity issues. I had the pleasure to interview Executive Chef Ethan McKee. With more than 20 years of culinary experience, Chef McKee brings the light, fresh flavors of Italy to Urbana in Washington, D.C.’s Dupont Circle neighborhood. Early in his career, McKee attended culinary school at L’Academie de Cuisine in Gaithersburg, MD and worked alongside James Beard-nominated Chef Todd Gray at Equinox Restaurant. During his tenures as executive chef at Rock Creek and Circle Bistro, both restaurants were recognized among the “100 Very Best Restaurants” by Washingtonian Magazine. 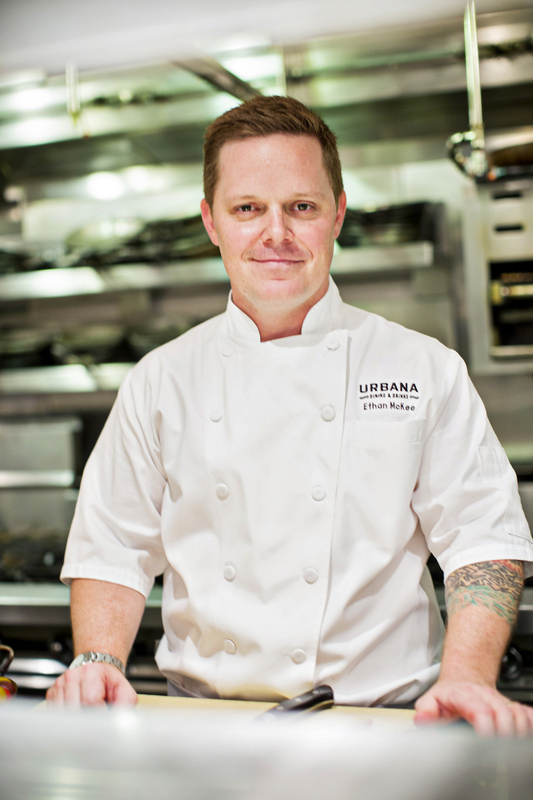 At Urbana, McKee is committed to being a leader in sustainability, cooking with quality ingredients, and standing as a hallmark modern Italian restaurant. He makes all pasta and pizza dough in-house and sources fresh produce from a 1,000-square-foot rooftop garden. In 2017, Executive Chef Ethan McKee was recognized for his rooftop garden practices and produce, winning awards from Slow Food DC and EdibleDC Magazine. I practically grew up in restaurants. When I was a kid, my mother worked front of the house in restaurants in Austin, Texas and Northern Virginia. I used to help her work catering events and got the bug at an early age. I always knew this would be a career that required dedication and perseverance. I was willing to put in the time and hard work necessary to move up in this business because that was the example set by the chefs that I worked for. Bill Jackson at Great American Restaurants taught me about having a work ethic that matched his passion for food; Luc Meyer at Left Bank in Vail, Colorado taught me about consistency, sticking to the fundamentals, and never giving up; and Todd Gray at Equinox taught me about combining all of those lessons with amazing creativity that helped me to take my cooking to the next level. My specialty has evolved over my years as a chef. I have moved from French, to New American, to most recently, Italian cuisine. I first cooked pasta with Todd Gray at Equinox and was immediately hooked. It’s fun, unpretentious, comforting food that still allows me to stretch my legs creatively and employ some serious techniques. One of the moments that made the most impact on me as a chef happened early in my career. I was a new line cook at the Left Bank in Vail and our Executive Chef Luc Meyer called the culinary team together to tell us that he had been diagnosed with bone cancer and would be undergoing treatment. Most of us assumed he would be taking time off from the restaurant and handing the reigns over to his sous chef, but that’s not what happened. Instead, once a month, Luc would drive his Ferrari over the mountain to the airport, take a jet to Little Rock, Arkansas for treatment, fly home to Colorado, and work a full dinner service with a chemotherapy drip in a hip pack. He never missed a service and never slowed down or stopped demanding the absolute best from his cooks. Luc is probably the baddest motherf*cker I have ever known. I think of him any time I feel discouraged or I don’t have the energy to push through. He taught me about determination and was the embodiment of a will to survive. He did survive, by the way. He eventually did hand over the restaurant to his Sous Chef Jean Michel and retired in Vail​. Last I heard, he was enjoying his retirement and skiing as many days of the season he could. When I was younger, I would have said success was in getting starred restaurant reviews, or being on “top restaurant” lists. Now, after 22 years in the business, my definition of success is more about finding a balance between work and home. Running my restaurant well, watching my staff grow, making my customers happy, and still having time to spend with my family feels like success to me. In my first position running a kitchen, I would consider my management style a failure. I was so focused on making things perfect and expecting perfection from everyone else that I became a bit of a tyrant. I was so angry all the time and the stress actually made me physically ill. From that experience, I learned that leading a successful team is about motivating people in a positive way and leading them to do their best work out of a love for the food, not out of fear of being yelled at or humiliated. About a year ago, we launched a chef’s table called Cicchetti at Urbana. Every Saturday night at our 10-seat pizza bar, I cook eight small courses based on what is fresh in our rooftop garden or our local farmers & purveyors and what I find exciting at the moment. The garden is the other project that I am most excited about right now. I started the garden five years ago with a handful of 4′ x 4′ boxes. This summer, we planted 60 boxes of tomatoes, herbs, squashes, greens, peppers, and much more. My favorite part of the day is my dedicated “garden hour” where I spend time on the roof watering, weeding, and harvesting produce to serve that night in the restaurant. Don’t look for shortcuts. Cooking well comes through repetition. Choose your jobs wisely and give each job at least a year to learn to do it well. Take the time to work every station, refine your technique, and build speed. Work for chefs that will challenge you in a positive way and inspire you to do your best work. Take pride in your cooking, but keep your ego in check. Respect your chef, respect your coworkers, and respect yourself. Cooking is hard work but it should still be fun. Knowing that there’s no such thing as a perfect dish. Focus on the fundamentals, season well, create balance in flavors and textures, and make it beautiful. Food has been the common language of my family for as long as I can remember. I grew up in the restaurant world, hearing and talking about food with my parents, listening to stories about my grandfather’s famous chili and my grandmother’s prize-winning jams. My wife and I met while working in a restaurant and our relationship was built on cooking together, reading cookbooks and talking incessantly about food and restaurants. Our kids have grown up in the kitchen with us, helping to cook as soon as they could stand on a footstool. To me, food is family; it’s what brings us together through shared history and nightly rituals, generation after generation. Learning to cook is easy if you have a passion for it. Cooks that don’t have a passion for cooking great food cannot be taught. Don’t take yourself too seriously. Cooking should be fun. No matter how many hours you put into your work there will always be more to learn. Don’t forget about your friends and family. It’s easy to become obsessed with the work. Give yourself a break sometimes. Plant a garden. It’s a great excuse to take a break and get outside and get some fresh air. The Obamas! I would like to do a Cicchetti dinner for them. During their time in D.C., they have shown how much they love good food and good restaurants. I would also love to show Michelle my garden and talk to her about the amazing work she has done to promote schoolyard gardens and healthy eating, and reducing food insecurity in the U.S.